Phosphate suppliers and dishwasher detergent producers have voiced strong opposition to a proposal by the European Parliament's Environment Committee to ban all but trace amounts of phosphates in household dishwasher detergents sold within the EU beginning in 2015. The parliamentary committee approved the dishwasher recommendation on 15 June as part of a wider proposal that also calls for restricting phosphates in household laundry detergents beginning in 2013. Specifically, the committee recommended that phosphorus compounds in detergents not exceed 0.5 gram per standard load. The goal of the proposal is to reduce the discharge of phosphates into surface water, as phosphates can combine with other plant nutrients such as nitrogen and contribute to eutrophication. This results in excessive phytoplankton growth that kills off fish and other aquatic plant life. The largest source of phosphate discharge into surface water is agriculture, mainly from fertilisers, but also livestock feed, followed by human sewage and then detergents. The parliamentary committee was acting on a European Commission draft regulation announced last November to limit phosphorus content in laundry detergents by 1 January 2013. But instead of setting a firm date for restricting phosphate use in dishwasher detergents the Commission asked for a new study to be completed by the end of 2014. The Environment Committee's phosphate recommendations will be debated in the European Parliament with a vote expected this November. Any new phosphate regulations would require dual approval of parliament and the European Council of Ministers, which directly represent all EU member nations. The Committee's recommendations also include assessing whether phosphate restrictions should be extended to industrial and institutional detergents by the end of 2016. Most western European nations, including the UK, France, Germany, Italy, Belgium and the Netherlands, have already either banned or restricted the use of phosphates in household laundry detergents. 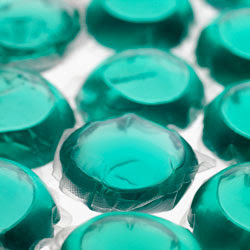 France will ban dishwasher detergent phosphates beginning in 2012, while Sweden and Finland are considering dishwasher bans. Sylvie Lemoine, director of technical and regulatory affairs at the Brussels-based International Association for Soaps, Detergents and Maintenance Products (AISE), tells Chemistry World that the requirements for dishwasher detergents, which are directed at hard surfaces, such as metal, glass, ceramic and plastic, are very different to laundry detergents used to clean textiles. While the basic scientific know-how to manufacture effective phosphate-free laundry detergents is 'pretty much a done deal,' technology for phosphate-free dishwasher detergents is 'not yet fully developed,' says Lemoine. Phosphates serve numerous functions in detergents, such as neutralising hard water, dispersing dirt and preventing incrustation. Lemoine says that most laundry detergent manufacturers use zeolites - microporous aluminosilicate minerals - as a substitute in low phosphate products. But zeolites are abrasive and cannot be used in dishwasher detergents, she adds. The European polyphosphate industry research group (CEEP) a sector group of the European Chemical Industry Council (Cefic) states that dishwasher detergent manufacturers are focusing on two approaches for phosphate free products. The first uses 'classic' chemicals, such as citrates and carbonates. But the CEEP says these are 'ineffective, even if boosted by significant doses of additives such as phosphonates, polymers and bleaches'. The second approach uses new 'high tech' aminocarboxylates or derivatives. 'To our knowledge, only one of these new molecules has been successfully used to replace phosphates in a significant market share detergent,' CEEP says. The environmental and health impacts of the new chemicals and their co-additives have not yet been fully assessed, CEEP states. The Environment Committee's target date of 1 January 2015 for banning dishwasher detergent phosphates would be 'very challenging for industry to meet in order to deliver products which perform well, both in terms of cleaning efficiency as well as total environmental profile,' Lemoine says, adding that 2018 at the earliest would be a more realistic target date. That said, the AISE is not officially opposed to phosphate restrictions on either laundry or dishwasher detergents, Lemoine says, adding that manufacturers would rather have one set of EU rules restricting phosphates than a jigsaw puzzle of various national regulations. While opposing a phosphate ban in both laundry and dishwasher detergents, CEEP, like AISE, appears to be focusing on stopping the proposed 2015 dishwasher ban. Caroline Andersson, CEEP sector group manager, tells Chemistry World that the potential impacts of phosphate free dishwasher detergents on hygiene, household energy use, water consumption and waste water treatment needs further study before a ban is legislated.